French Bible exegete; lived in Troyes, where, probably, he was born about 1060-70; died between 1130 and 1140. His uncle and teacher was Menahem benḤelbo, whom Ḳara often cites in his commentaries, these quotations being almost the only source of knowledge concerning Menahem's exegesis. Ḳara frequented Rashi's house; it is even possible that he was Rashi's pupil (Zunz, "Z. G." p. 68), though this is denied by Epstein. At least they quote each other (comp. Joseph Ḳara on Prov. iv. 4, v. 14, vi. 23, xviii. 22; Rashi on Judges iii. 26; Num. xvii. 5, xxiv. 14; Isa. x. 24). In Rashi's house Ḳara also made the acquaintance of Samuel ben Meïr (comp. RaSHBaM on Gen. xxxvii. 13). They likewise quote each other (comp. RaSHBaM on Gen. xxiv. 60 and Num. iv. 10; Rosin, "R. Samuel ben Meïr," pp. 12 et seq., 72 et seq. ; Joseph Ḳara on Amos iii. 12; Job xi. 17; Gen. x. 15; Porges, in "Monatsschrift," 1883, p. 169). Isaac Ḳara, of whose exegesis specimens are given in "Monatsschrift," 1864, p. 219; 1865, p. 384 (comp. Rosin, l.c. pp. 24 et seq. ), may be a son of Joseph. The surname "Ḳara" is usually taken to be a professional name, meaning "reader" or "interpreter of the Bible" (see Jew. Encyc. iii. 168, s.v. Bible Exegesis). 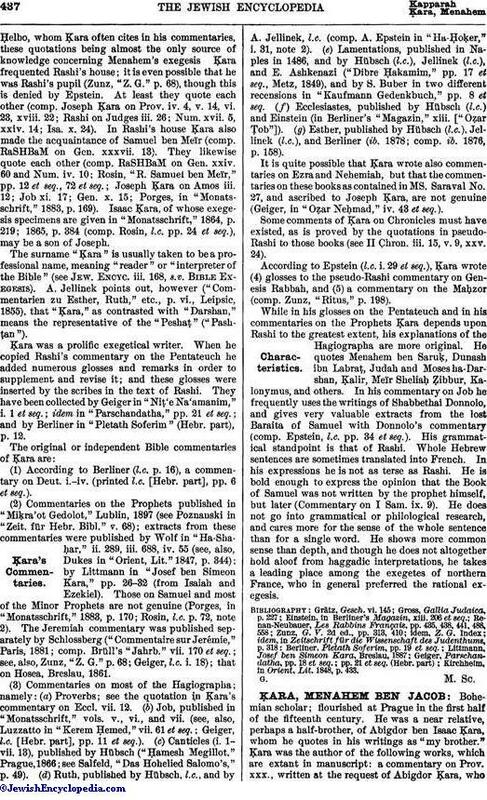 A. Jellinek points out, however ("Commentarien zu Esther, Ruth," etc., p. vi., Leipsic, 1855), that "Ḳara," as contrasted with "Darshan," means the representative of the "Peshaṭ" ("Pashṭan"). Ḳara was a prolific exegetical writer. When he copied Rashi's commentary on the Pentateuch he added numerous glosses and remarks in order to supplement and revise it; and these glosses were inserted by the scribes in the text of Rashi. They have been collected by Geiger in "Niṭ'e Na'amanim," i. 1 et seq. ; idem in "Parschandatha," pp. 21 et seq. ; and by Berliner in "Pletath Soferim" (Hebr. part), p. 12. (1) According to Berliner (l.c. p. 16), a commentary on Deut. i.-iv. (printed l.c. [Hebr. part], pp. 6 et seq.). (2) Commentaries on the Prophets published in "Miḳra'ot Gedolot," Lublin, 1897 (see Poznanski in "Zeit. für Hebr. Bibl." v. 68); extracts from these commentaries were published by Wolf in "Ha-Shaḥar," ii. 289, iii. 688, iv. 55 (see, also, Dukes in "Orient, Lit." 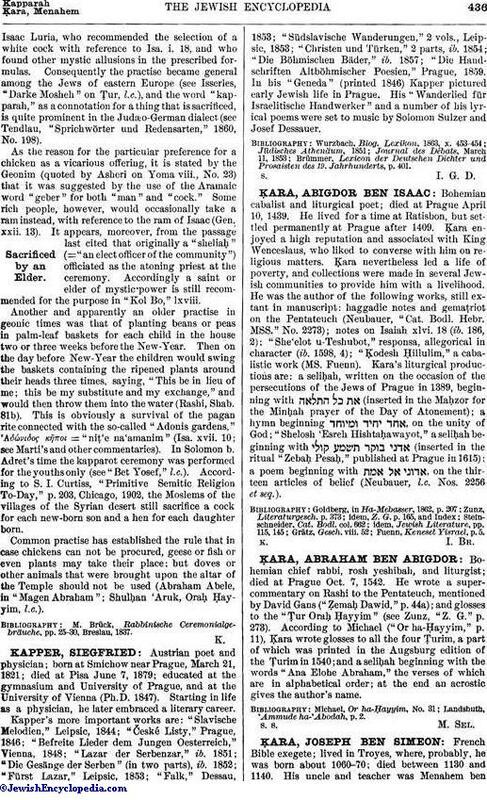 1847, p. 344); by Littmann in "Josef ben Simeon Kara," pp. 26-32 (from Isaiah and Ezekiel). Those on Samuel and most of the Minor Prophets are not genuine (Porges, in "Monatsschrift," 1883, p. 170; Rosin, l.c. p. 72, note 2). The Jeremiah commentary was published separately by Schlossberg ("Commentaire sur Jerémie," Paris, 1881; comp. Brüll's "Jahrb." vii. 170 et seq. ; see, also, Zunz, "Z. G." p. 68; Geiger, l.c. i. 18); that on Hosea, Breslau, 1861. (3) Commentaries on most of the Hagiographa; namely: (a) Proverbs; see the quotation in Ḳara's commentary on Eccl. vii. 12. (b) Job, published in "Monatsschrift," vols. v., vi., and vii. (see, also, Luzzatto in "Kerem Ḥemed," vii. 61 et seq. ; Geiger, l.c. [Hebr. part], pp. 11 et seq.). (c) Canticles (i. 1-vii. 13), published by Hübsch ("Ḥamesh Megillot," Prague, 1866; see Salfeld, "Das Hohelied Salomo's," p. 49). (d) Ruth, published by Hübsch, l.c., and by A. Jellinek, l.c. (comp. A. Epstein in "Ha-Ḥoḳer," i. 31, note 2). (e) Lamentations, published in Naples in 1486, and by Hübsch (l.c. ), Jellinek (l.c. ), and E. Ashkenazi ("Dibre Ḥakamim," pp. 17 et seq., Metz, 1849), and by S. Buber in two different recensions in "Kaufmann Gedenkbuch," pp. 8 et seq. (f) Ecclesiastes, published by Hübsch (l.c.) and Einstein (in Berliner's "Magazin," xiii. ["Oẓar Ṭob"]). (g) Esther, published by Hübsch (l.c. ), Jellinek (l.c. ), and Berliner (ib. 1878; comp. ib. 1876, p. 158). It is quite possible that Ḳara wrote also commentaries on Ezra and Nehemiah, but that the commentaries on these books as contained in MS. Saraval No. 27, and ascribed to Joseph Ḳara, are not genuine (Geiger, in "Oẓar Neḥmad," iv. 43 et seq.). Some comments of Ḳara on Chronicles must have existed, as is proved by the quotations in pseudo-Rashi to those books (see II Chron. iii. 15, v. 9, xxv. 24). (5) a commentary on the Maḥzor (comp. Zunz, "Ritus," p. 198). While in his glosses on the Pentateuch and in his commentaries on the Prophets Ḳara depends upon Rashi to the greatest extent, his explanations of the Hagiographa are more original. He quotes Menahem ben Saruḳ, Dunash ibn Labraṭ, Judah and Moses ha-Darshan, Ḳalir, Meïr Sheliaḥ Ẓibbur, Kalonymus, and others. In his commentary on Job he frequently uses the writings of Shabbethai Donnolo, and gives very valuable extracts from the lost Baraita of Samuel with Donnolo's commentary (comp. Epstein, l.c. pp. 34 et seq.). His grammatical standpoint is that of Rashi. Whole Hebrew sentences are sometimes translated into French. In his expressions he is not as terse as Rashi. He is bold enough to express the opinion that the Book of Samuel was not written by the prophet himself, but later (Commentary on I Sam. ix. 9). He does not go into grammatical or philological research, and cares more for the sense of the whole sentence than for a single word. He shows more common sense than depth, and though he does not altogether hold aloof from haggadic interpretations, he takes a leading place among the exegetes of northern France, who in general preferred the rational exegesis. Kirchheim, in Orient, Lit. 1848, p. 433.